I'm so excited to bring you this review! Over the weekend I got a $5 off $10 coupon from Ulta and being the good little consumer that I am, I had to go over immediately to spend it. 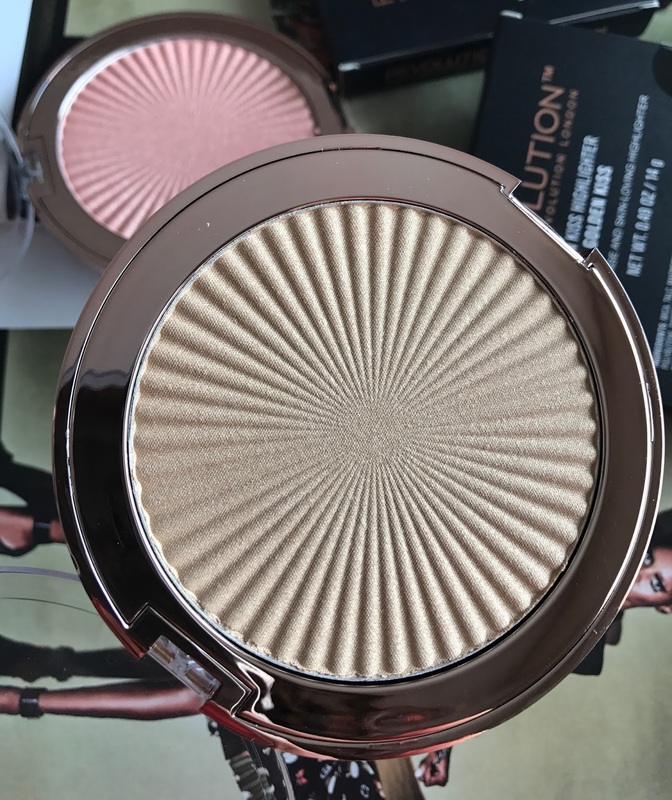 I already knew that I wanted to visit the Makeup Revolution section because I had heard that a few of their newer products were hitting stores and I was lucky enough to find a few of them. 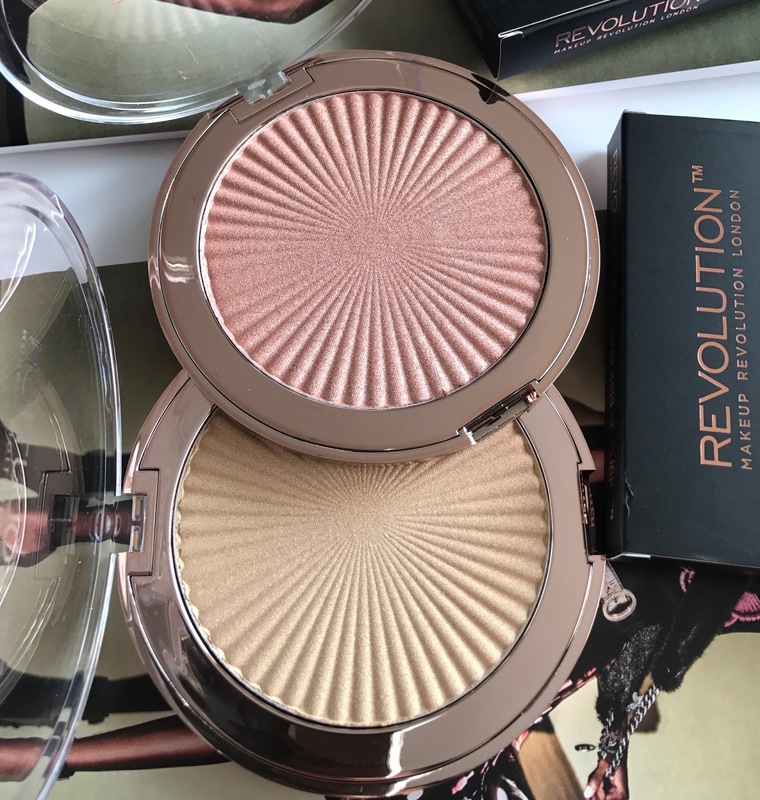 What excited me most had to be these Makeup Revolution Skin Kiss Highlighters. 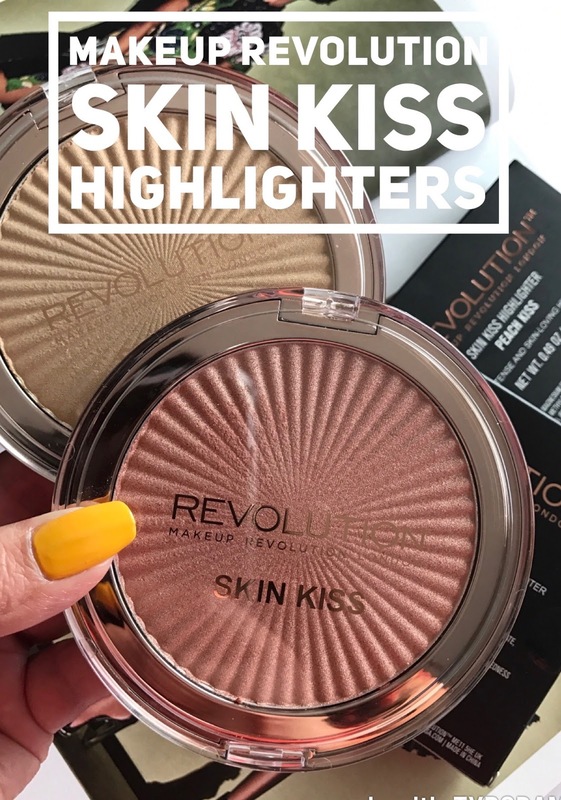 First let's get the deets out of the way: Makeup Revolution Skin Kiss Highlighters come in three shades and are $9 each. I had my $5 off coupon and Makeup Revolution was BOGO 50% off, which happens all the time at Ulta, so I only paid nine dollars and change for both of the shades I picked up. Quite a deal right? As usual Makeup Revolution knocks it out of the park with their very high-end looking packaging. With their beautiful black boxes with rose gold lettering, you wouldn't even guess that this is a $9 product. Also, these pans are HUGE, each with .49 oz of product, which means these will last 4-ever. Talk about a value. This is why Makeup Revolution is one of my favorite brands. 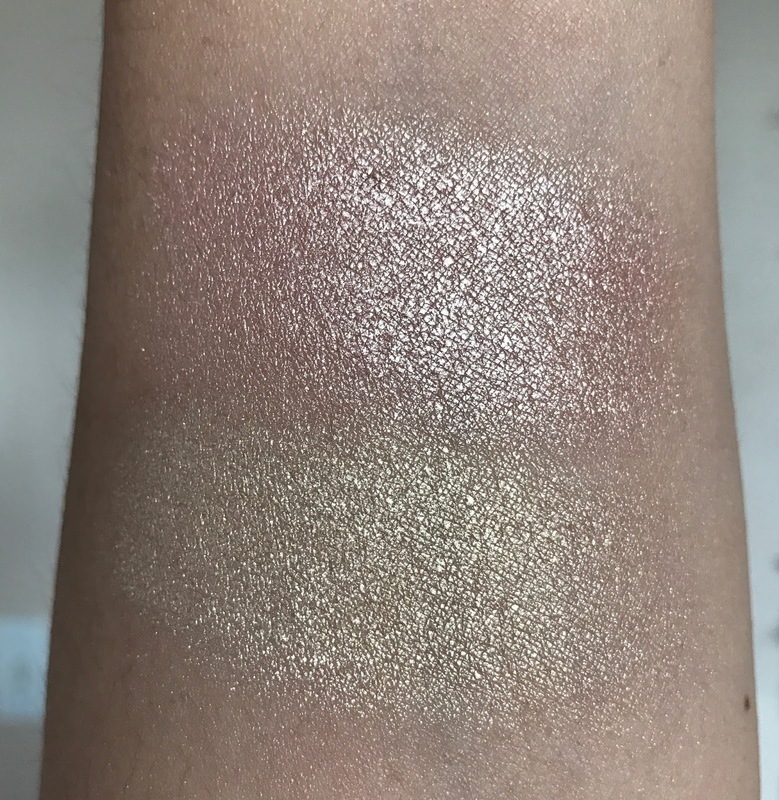 Of course I had to swatch these new highlighters right away, we all wanted to know how they were! With so many highlighters coming out at the drugstore recently, people want to know which are the best. For sure I can tell you that these are amazing, especially Peach Kiss. 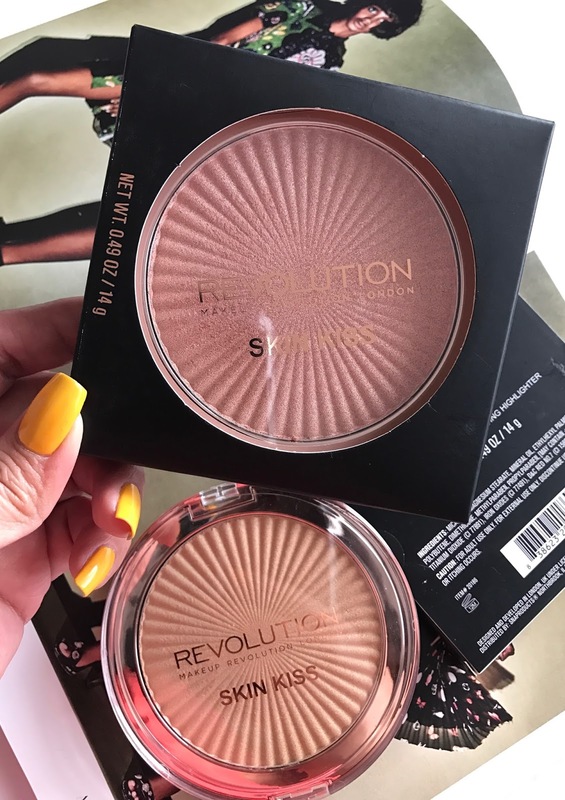 The formula of the Makeup Revolution Skin Kiss Highlighters is super soft and buttery. They blend into the skin beautifully and have an incredible reflective, metallic finish. 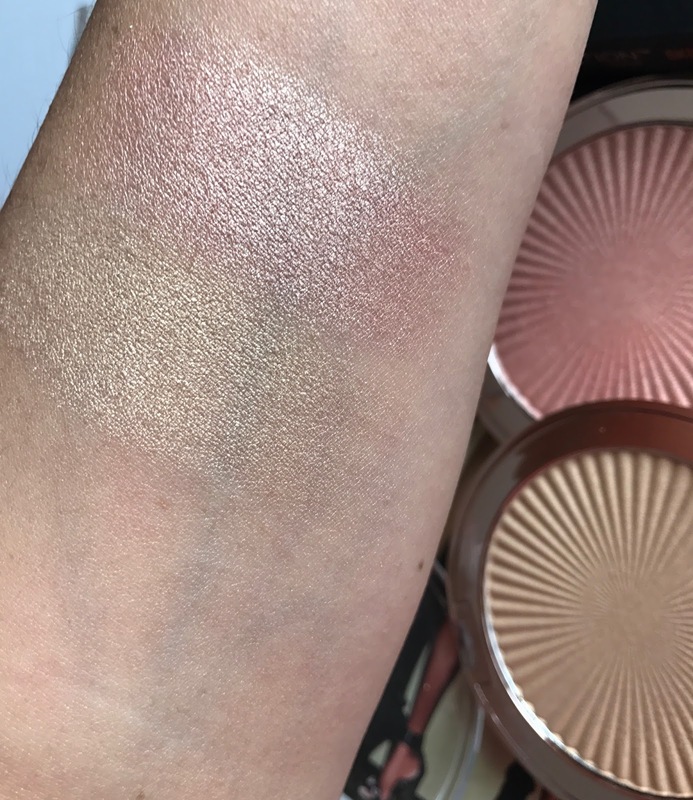 The formula is dense and feels like a buttery cream, I can't get over it whenever I have swatched it with my fingers. While the strong metallic finish will not be for everyone, I think these are pretty great. 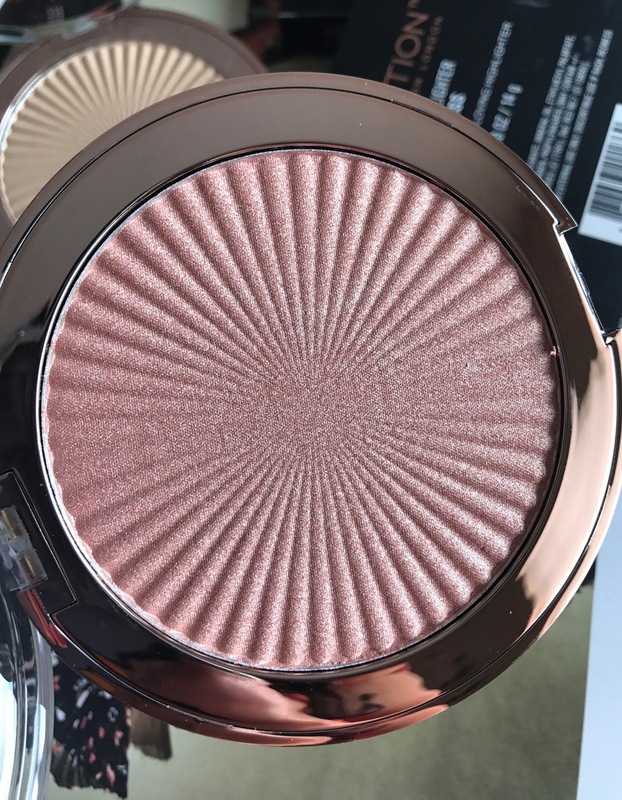 I am not one of those "in your face" type of highlighter persons, and still I am in love with Peach Kiss. I find that I can control it enough to make it wearable even on my 43 year old skin. Makeup Revolution Skin Kisses are multi taskers: use as an eyeshadow or a gorgeous highlight. You simply can't go wrong with their low price tag, great quality and beautiful shades. If you find a BOGO 50% off deal I suggest both and if not you at least need to own Peach Kiss.